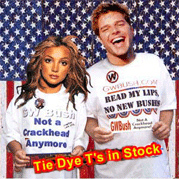 George W Bush -- not a crackhead! "I'm not going to talk about what I did as a child. What I am going to talk about -- and I am going to say this consistently -- [is that] it is irrelevant what I did 20 to 30 years ago. What's relevant is that I have learned from any mistakes I made. I do not want to send signals to anybody that what Gov. Bush did 30 years ago is cool to try." --Gov. Bush in an interview with WMUR-TV in New Hampshire, when asked if he had used "drugs, marijuana, cocaine" (See news story.) If we are going to save a generation of young people, our children must know they will face bad consequences for criminal behavior. Sadly, too many youths are not getting that message. 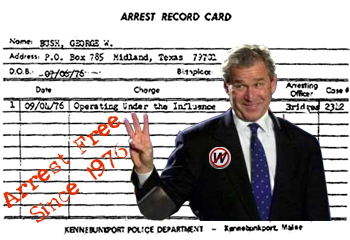 Our juvenile justice system must say to our children: We love you, but we are going to hold you accountable for your actions.--Bush campaign literature. Adulthood begins at 30 -- or later. The mark of a leader is being able to admit when you're wrong. I'm acknowledging that I was wrong to lower the age for adult prosecution in Texas to 14. The recent revelation of a youthful mistake I made at age 30 has forced me to reconsider my position that children should be tried as adults. Maybe 30 even is too low. I would like to promise to you that I didn't commit any other youthful indiscretions after age 30, but maybe I did. Who can say? I guess I could say, but I won't. Unless, someone else does before Tuesday. Perhaps 40 is when adulthood really starts. That's when I finally quit drinking--except when I was caught on camera boozing it up. Perhaps I still have still more youthful mistakes to commit. If I get caught, I promise to uphold the dignity of the office by learning from each one of them. One last thing: Larry Flynt, I'd like to make it perfectly clear that if you get the abortion story into the press we will kill you. OK, just wanted to get that out there. Remember: the W stands for all the women I've knocked up--uh oh, Karen I think I just said something bad again!